Duration® Exterior Acrylic Coating is formulated with PermaLast® technology and infused with advanced acrylic co-polymers for long-lasting performance. Duration is self-priming and provides a mildew-resistance coating. 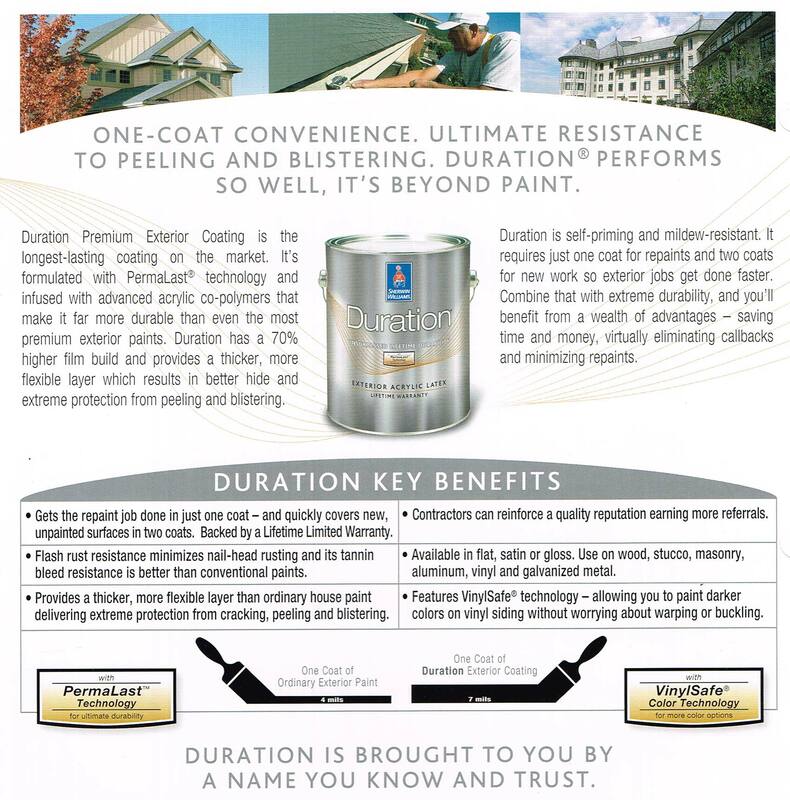 DESIGN ADVICE: For excellent durability and hide, use Duration® Exterior for one-coat convenience on repaints. Performance and protection you can count on. 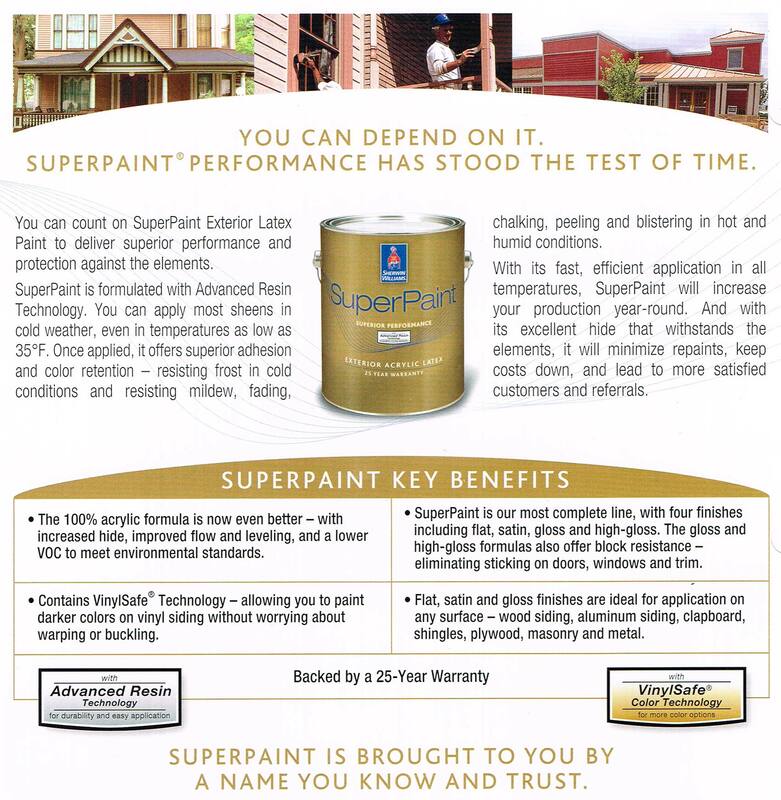 SuperPaint offers coverage and durability, providing a dirt-resistant and mildew-resistant coating that withstands the elements. You can apply most sheens in cold weather, even in temperatures as low as 35° F.
DESIGN ADVICE: Once applied, it offers excellent adhesion and hide – resisting frost in cooler conditions and chalking, peeling and blistering in hot and humid conditions. With its fast, efficient application in all temperatures, SuperPaint will increase your production year-round. And with its ability to withstand the elements, it will minimize repaints, keep costs down, and lead to more satisfied customers & referrals. 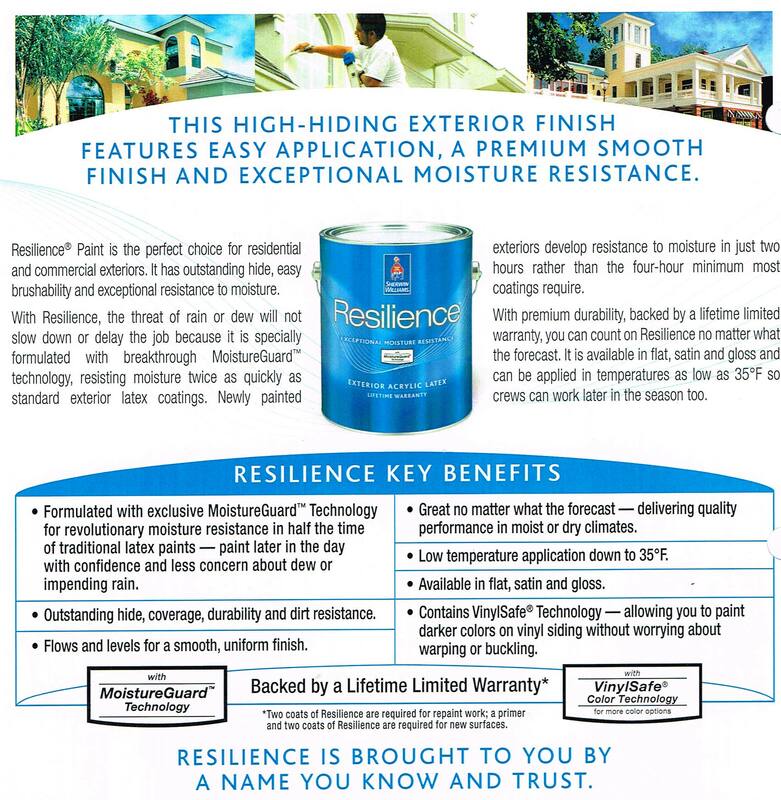 Resilience® Paint is the perfect choice for residential and commercial exteriors. It has outstanding hide, brushability and exceptional resistance to moisture.With Resilience, the threat of rain or dew will not slow down or delay the job because it is specially formulated with breakthrough MoistureGuard™ technology, resisting moisture twice as quickly as standard exterior latex coatings. DESIGN ADVICE: Newly painted exteriors develop resistance to moisture in just two hours rather than the four-hour minimum most coatings require.